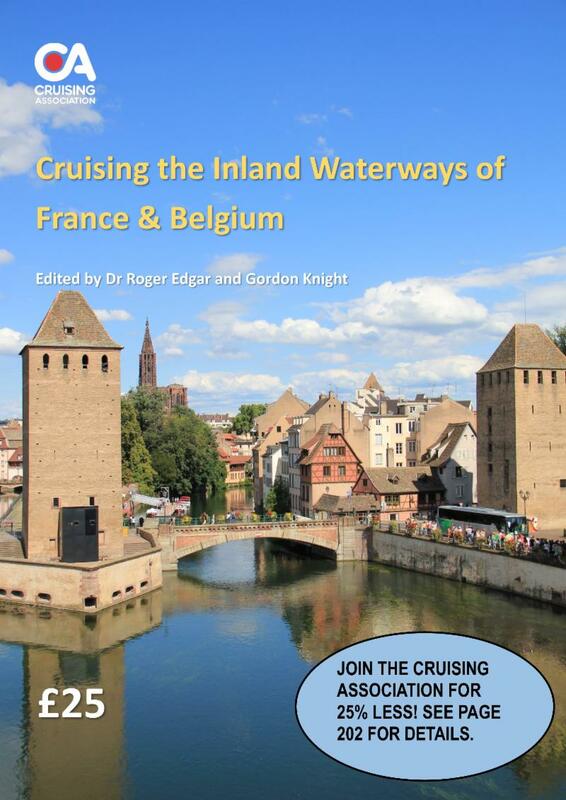 The 2019 edition of the Cruising Association’s guide Cruising the Inland Waterways of France and Belgium has just been published. This authoritative 204-page guide, edited by Gordon Knight and Dr Roger Edgar, is now in its 23rd edition and available directly from the CA’s online shop at https://www.theca.org.uk/catalog as well as from the Lulu.com bookstore, Amazon, and Barnes & Noble. Described as their ‘Bible’ by regular users and yacht skippers planning routes to and from the Mediterranean, the guide contains a wealth of information on cruising routes, cruising preparations, supplies, equipment, licences and documents, useful addresses, books and websites as well as listing around 250 mooring places throughout France and Belgium. The listings include comments on facilities, depths, prices, closest shops, restaurants and nearby attractions. The latest edition also includes details of fuel locations, either alongside or within easy jerrycan distance. Produced by the CA’s European Inland Waterways Section, the Guide is updated annually from reports contributed by CA members who are actively cruising the waterways, over 150 of which were submitted for the latest edition alone. Priced at £25 plus p&p, the Guide includes a 25% discount offer on first year membership to purchasers applying online for CA membership during the year. CA members have access to the online edition of the guide, which is updated up to three times a year and contains hyperlinks to the CA’s proprietary CAptain’s Mate app, enabling users to access the most up to date information on mooring locations. In addition to the France and Belgium guide, the CA’s European Inland Waterways Section also produces full colour mini-guides to several of the French inland waterways, a German Rhine Guide and a range of information sheets on all aspects of inland waterways cruising. Members also exchange information and cruising advice via the Section’s forum, European Inland Waterways Net, which is an especially valuable resource for cruisers new to the inland waterways. Further information is available on the Section’s webpage at https://www.theca.org.uk/public/sections/eiw.